The cover photo for this blog is from a math lesson I taught last week. It was based off of an Estimation 180 activity in which students estimate how many almonds are in a 1/4 cup measuring cup. I love the way you can actually see students thinking and working together. The student in the pink shorts is adding her estimate to our numberline, which I will talk more about later. There are a few students watching her. Some kids are looking at the timeline and talking about their answers. The kid in the orange hat is still working on his estimate and counting the almonds he can see on the image. The student with the blonde ponytail is looking at her estimate. I love the pensive look on her face. The moment that this photo was taken reminds me that math is a dynamic, active, and a team subject. I decided to start estimation as an introduction to a unit on rounding. There are so many real-world opportunities to round numbers with estimation. And one of the main uses of rounding is estimation. Hopefully, students will have some buy-in on learning rounding since they already had to use it to solve estimation problems. Andrew Stadel of Estimation 180 has a great video about using a clothesline as a numberline for estimation and other math applications. I put up a clothesline on my whiteboard and showed the students the image of the almonds. They began to think about how many almonds were in the cup. Once they had some time to think, I asked what number they thought was too low. I called on many students (8-10) to try to get a good gauge for what a consensus may be. We agreed on the number 12 since you can basically count that many on the picture. Then I asked what number was too high but still reasonable. Some students said numbers like one million. While I agree that this is too high, the idea is to get a reasonably close number to help limit their estimations and hone the skill of estimation. When we agreed on the numbers that were too high and too low, I put cards with those numbers at each end of the numberline. 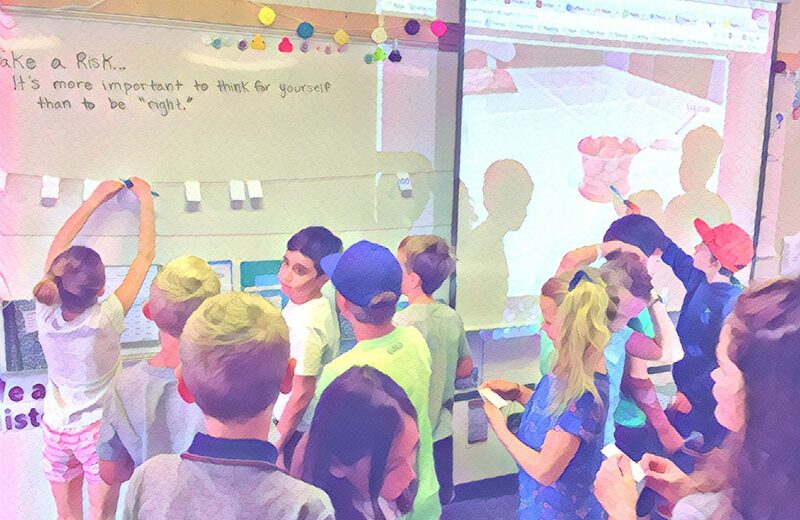 Before they went off to estimate, I shared the quote that I wrote on the board: Take a Risk… It’s more important to think for yourself than to be “right.” I hoped that students would think for themselves and not worry about what other students wrote. I also wanted to encourage them that there is not always one right answer with math. Students wrote their estimates and added them to the board. When all the estimates were on the numberline, we talked about how some of them were not in order. Once the numberline was in order, students shared their strategies of how they decided on their estimate. Finally, students discussed what an appropriate reaction would be (whether over, under, or right on), and I showed the actual amount of almonds. They were excited and positive with each other. The next day, I showed the students another image from Estimation 180 that shows a large jar of almonds with the same measuring cup next to it. Again we began by agreeing on a number that was too low and a number that was too high. The question was how many almonds are in the jar? But the students quickly realized that finding the number of 1/4 cups that would fit into the jar was also a good strategy. Students did not have the math knowledge to multiply these numbers in their heads. I asked what number 28 (the number of almonds in a 1/4 cup that they knew from the day before) was close to. The students decided 25 or 30 were both friendly numbers to add up. Many students used their journals or whiteboards to help them. Some used 25 or 30 multiplied by the number of 1/4 cups that they thought were in the jar to create their estimate, others continued on with adding up the number 28 , and some just made their best guess by looking at the jar. Timing is a little tricky. Not all students were finished with their calculations when I called for everyone to come back together. I explained that it is a bit of a contradiction. They may have been wondering why I was not giving them time to finish because we have discussed that speed is not important in math (video from Youcubed). I explained that we are trying to learn estimation as a quick way to find solutions, so it was ok to use what they discovered in the time they had to make a guess about the estimate. Once all the estimates were up on the timeline and we discussed the students’ strategies, I showed the students the number of 1/4 cups in the jar from the answer image from Estimation 180. I did not show the total number of almonds, as I wanted to give them time to try to find a way to figure it out. They knew that they needed to find 40×28. We decided that finding an estimate answer would work, so they could find 40×28, 40×25 or 40×30. It was amazing to watch them calculate on their white boards. Some students tried to add up all the 28’s, some were breaking the numbers apart to multiply more easily (40×20 and 40×5). Some students added up 40 3’s, knowing that they could add the zero back later. They did not have the standard algorithm for multiplication or any direct instruction on multiplying double digit numbers, but they were able to find a way to work on the problem. I recently read an article by Ross Cooper about Project Based Learning in Math Class in which he suggests: “Design a task in which students will have to learn this material in order to successfully get the job done.” This really resonated with me as I watched students work together in productive struggle to figure out a way to add up these numbers. Now they are more ready to learn rounding, and we can always think back to the almonds as a smaller case. I look forward to finding more ways to challenge students to discover the math that they need as an introduction to a unit.